You cannot go past the story behind the country's national flower or mugunghwa for interesting South Korea facts. Pink with a magenta eye, the Hibiscus Syriacus, a popular cultivated shreb(in the Hibiscus family). 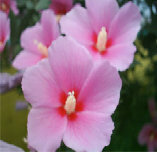 This celebrated flower is commonly referred to as, "The Rose of Sharon" or mugunghwa as it is known in Korean. Every year, you can expect to see a bloom of mugunghwa across the entire country from July to October. They are remarkably hardy and able to withstand both blight and insects. The National Flower of South Korea, represents immortality, determination and perseverance of its people as mugung means immortality and hwa means flower in Korean, and is often incorporated in National emblems. In addition, Korea is compared poetically to "The Rose of Sharon", in the South Korean National Anthem. Interesting South Korea facts will definitely include the Korean Language or Hangeul. In the 15th century, a national writing system was commissioned by Sejong the Great, the system being currently called Hangeul. Koreans had used Hanja and phonetic systems like Hyangchal, Gugyeol and Idu extensively for over a millennium. The Korean language is now spoken by more than 70 million people, not just in North and South Korea but also in parts of China and Japan. With the continued popularity of Korean TV dramas, movies and the kpop buzz, more and more people are interested in learning the Korean language. So, if you are thinking of going to Korea, whether it be for business, work, leisure or just to SHOP! SHOP! SHOP! learn the Korean language and travel with confidence! Interesting South Korea facts that you may not know is that the Korean National Flag is called Taegeukgi. The design are created to represent the principles of Yin and Yang in the Asian philosophy. The circle in the center of the flag is divided into two equal parts where the red area represents the positive cosmic forces of the Yang while the blue area represents the negative cosmic forces of Yin. These two forces combined brings together the concepts of continual movement, balance and harmony to characterize infinity. The circle is surrounded by four trigrams, one in each corner of the flag where each trigram represents one of the four universal elements - heaven, earth, sun and moon. The white backgound of the flag represents peace, purity and the homogeneity or the Korean people. "Aegukga" is the South Korean National Anthem, which means "The Song of Love for the Country" or "The Patriotic Song". The Republic of Korea or South Korea lies below the 38th parallel on the Korean peninsula in Eastern Asia. South Korea was founded on the 15th of August, 1948. And the National Anthem "Aegukga" was composed and adopted as the Countries National Anthem. The Korean Magpie, it is a common symbol of the Korean identity, and has been adopted as the "official bird" of numerous South Korean cities, counties and provinces.